The high school assembly took place on Thursday, Jan. 12 in the auditorium. Guest speaker Jonathan Leath, a life coach and pastor of Destiny Church in Moorestown, addresses students. While Martin Luther King Jr. Day is most often associated with the fight for equal rights, Moorestown High School sought to teach a greater message to its students during two tribute assemblies on Thursday, Jan. 12. With the theme being “follow your dreams,” students were given various examples of the greatness that can result from pursuing goals, such as in the case of MLK himself. “Our message is to let kids know what amazing results they can have if they follow their dreams and never give up,” Jennifer Stanksy, who co-advises the MHS student council alongside Kelly Gartland, said. Together, the two members of staff organized the school-wide event. Leading off the assembly, the YouTube video, “Live your Dreams — Best Motivational Video 2016,” was played before the student audience. During this five-minute video, the speaker — American spoken word artist, poet, rapper and filmmaker Prince Ea — explains the importance of following one’s dreams. Next, student council president Kevin Hughes took the stage to deliver his thoughts on the importance of following a dream. He explained that around each MLK Day, people should remember the American Baptist minister and activist and reflect on the power of a dream. 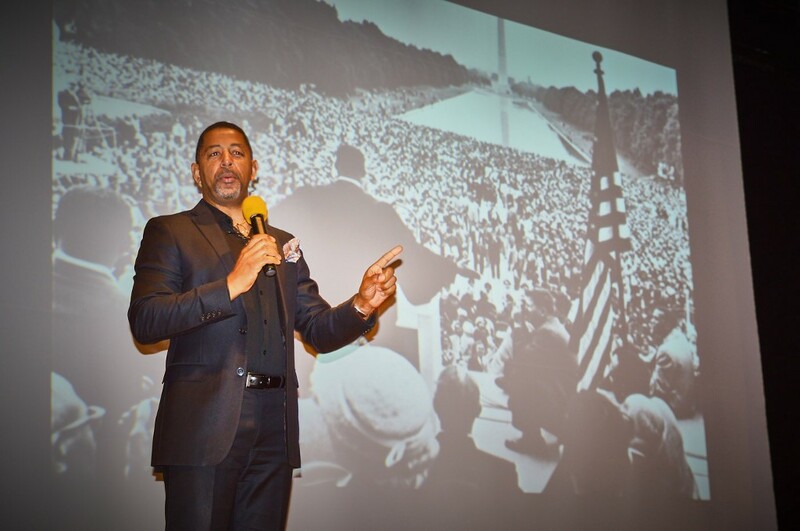 Continuing on the notion of pursuing dreams and achieving greatness, guest speaker Jonathan Leath, a life coach and pastor of Destiny Church in Moorestown, took the stage. In front of the audience, including his ninth-grade daughter Jael, the 47-year-old delivered students a dose of reality. He explained that in life, you don’t get participation trophies just for showing up. If you want to do something really great, you’ve got to do something different, think different, act different and talk different. Providing the students with four key pieces of advice, Leath again stressed no one is innately special, but if they work hard they can be. He also expressed how people treat others matters, everyone should take time to discover their purpose, and that character and integrity really do matter. “The real message is, if you really want anything out of life, you have to work for it. Success looks a lot like hard work,” Leath told The Sun. Demonstrating all that can come from hard work, 11th-grade student council member Alex Karanjia put together a video to conclude the assembly that highlighted five successful MHS alumni. These professionals included: Ellen De Obaldia, Class of 2004, Julianne Carlson, Class of 2006, Jonathan Clifford, Class of 2007, Nathan Achilly, Class of 2008, and Dan Cohen, Class of 2009.